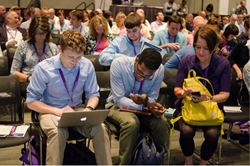 Higher-ed tech decision makers will explore new and emerging technologies when they attend the Transformational Technology in Higher Education conference March 24 – 25 in Denver. Attendees will follow this rapidly evolving environment which is vital in developing and sustaining a culture of innovation that accelerates positive change within and beyond institutions. Hundreds of higher education technology decision makers – including chief information officers and campus IT administrators – will gather in Denver at the Transformational Technology in Higher Education (TTHIED) conference from March 24 – 25, 2016. Attendees will explore the latest digital solutions, discover best practices being employed on campuses and participate in collaborative learning with colleagues and industry leaders. Formerly Campus Technology Forum, TTHIED will include a variety of keynote and concurrent sessions that feature new and emerging technologies. Program tracks include Leading Campus Transformation, Technology Pedagogy in the Digital Age, Designing a Connected Campus and Technology Solutions. Bryan Alexander, president of Bryan Alexander Consulting, LLC, will open TTHIED 2016 with his keynote “Halfway Through the Tsunami: Higher Education and the Digital Revolution.” Alexander will propose answers to the question “How is education changing under the impact of ever-advancing technologies?” by surveying social, economic and policy contexts while examining how education is changing under their impact and exploring leading trend lines for the digital world. In addition to three keynotes, TTHIED offers attendees nearly a dozen breakout sessions including “Wearable Technology and Virtual Reality: A New Era for Learning.” Emory Craig, Director of eLearning and Instructional Technologies at The College of New Rochelle, will demonstrate why higher education leaders should follow the latest and rapidly evolving developments in wearable technology. Early bird savings for TTHIED 2016 end Feb. 24. To register visit http://www.TTHIED.com or call toll free 1-800-287-0257. Join the conversation by following @TTHIED on Twitter and using and searching #TTHIED. For even more TTHIED 2016 updates, “like” Transformational Technology in Higher Ed on Facebook, and join the Transformational Technology in Higher Ed LinkedIn group. Transformational Technology in Higher Education Conference, formerly Campus Technology Forum, is a redesigned event for higher education IT executives and professionals to receive a more personalized conference experience. With more than 100 colleges and universities from across the nation represented, attendees have the opportunity to network with peers from a wide array of institutions and become a part of a larger community continuously seeking to advance the technological pedagogy of their campuses. Attendees will learn from industry experts and be exposed to the latest trends, tools and resources during collaborative and educational sessions. In an environment where finding solutions to technological challenges is the priority, attendees also have access to a variety of consultative vendors in the Expo Hall. LRP Conferences, LLC, an affiliate of LRP Publications, produces more than a dozen professional conferences and trade shows annually, including: Campus Technology Conference, Transformational Technology in Higher Ed Conference, Ergonomics Conference & ErgoExpo, Future of Education Technology Conference (FETC), HR in Hospitality Conference, HR Technology® Conference & Exposition, Recruiting Trends Conference, and National Workers’ Compensation and Disability Conference® & Expo. LRP Publications, headquartered in Palm Beach Gardens, Fla., is known as educators’ most trusted source for practical and legal education administration guidance and produces newsletters (Education Daily®), books, pamphlets, DVDs, audio conferences, eLearning courses, online services (Title1admin.com, EducationDaily.com and Special Ed Connection.com) and training tools to help educators implement sound programs and avoid compliance errors related to Title I, autism, discipline and more. LRP also produces professional education conferences including: National Institute on Legal Issues of Educating Individuals with Disabilities® and Special Education School Attorneys Conference. For a complete list of LRP products, eCourses and conferences, please visit http://www.lrp.com. Note: Media representatives interested in attending and covering TTHIED 2016 please email tthiedmedia(at)lrp(dot)com. Media representatives are required to register and will not be admitted into any TTHIED venues without a badge issued by TTHIED press staff. There is no cost for media registration.